Browser recording: Supports Internet Explorer, Netscape, Mozilla, Firefox and Safari. GUI based editing of tests: Ability to edit existing load test and build on the Test Cases. Parameterized Load Tests: Parameterized load tests feed the parameters automatically to the request and thus help simulate a more realistic usage environment. Response Validation: Validation of the URL requested. IDE Integration: Supports Eclipse, NetBeans, IBM Rational Application Developer, IBM Websphere Studio, IntelliJ Idea, JBuilder, JDeveloper and BEA Workshop Studio. Distributed Load Testing: Load generation can be distrIbuted on multiple machines and can be controlled from one central machine. Presents aggergated reults. Database Load Tests support: Supports load testing databases using JDBC. Advanced Browser Simulation: Network bandwidth throttling and IP Spoofing. Internal Reports: Reports can be exported to HTML, PDF CSV, XLS, XML etc. 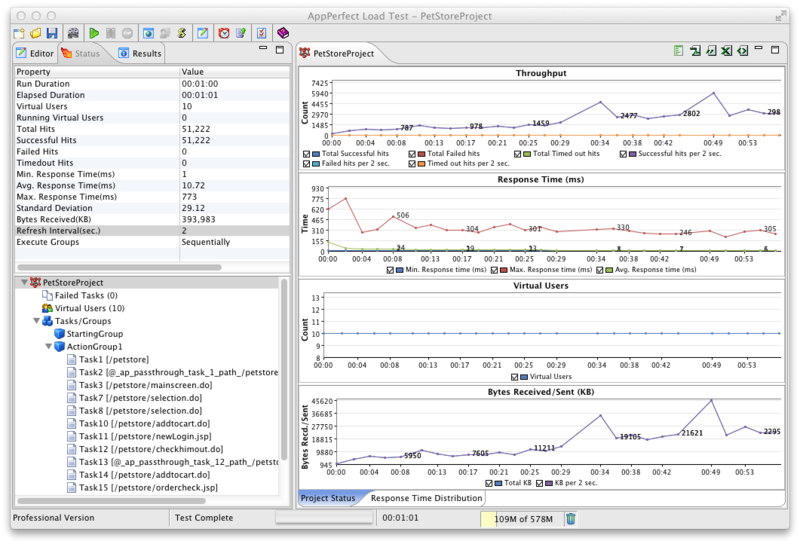 Scheduling & Notification: Scheduling using the AppPerfect Test Manager product. Notifications manager module can be used to send an email, SMS or file notification when a test is complete. System Monitoring: Target applications and servers can be monitored using a sophisticated agentless monitoring architecture so you can co-relate your results with your server behavior. Monitor key system resources such as CPU, disk, network and memory. AppPerfect Load Test is a fully Automated Load Test, Stress Test and Performance Test Solution that is easy to use and cost effective. Most application performance and stability issues arise only when the server is stressed with a high user load. AppPerfect Web Load Test helps you design and simulate thousands of users in a realistic manner which can be used to load test your application infrastructure for performance, reliability and scalability. Do you know the number of concurrent users/requests your application can support ? Is your current infrastructure sufficient to meet your user demand ? Will your application scale as more users access it ? How does your application's response time change as number of users increase ? Does your Web application perform the same after 96 hours of deployment as it did after 4 hours ? 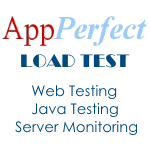 AppPerfect Load Test is easy to use with no programming required. It provides a unique view of the target machine with integrated Load Testing, Stress Testing and Performance Testing parameters such as response time and hit count along with monitoring of system resources such as CPU, disk, network and memory.